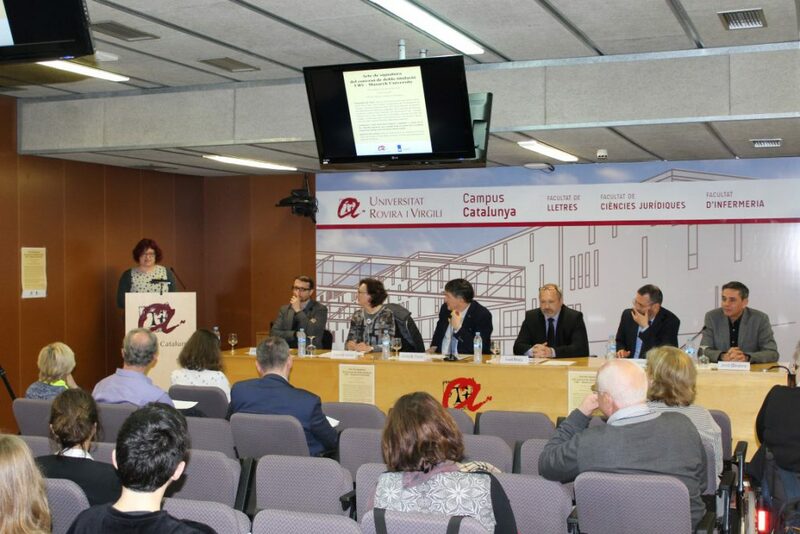 The agreement between the URV and Masaryk Uinversity was signed on the 13th April in the Conference Room of campus Catalunya. An agreement between the URV and Masaryk University in Brno in the Czech Republic will enable students of each university to study at the other and thus obtain a double degree in Catalan Language and Literature. Masaryk University is the only university in the world outside the Catalan speaking areas with a higher university qualification in Catalan. The Rector of the URV, Josep Anton Ferré, and the Vice-Rector for Internationalisation at the Czech university, Ivan Malý, signed the agreement on 13 April in the Conference Room at the URV’s Catalunya Campus. Through this agreement, the universities establish a system of equivalences and recognitions so that students of one institution can study at the other. Each year, depending on availability, a new mobility plan will specify the number of students who will be able to travel. Some, such as Marie Prikrylova from Masaryk University, is already registered at the URV for the present academic year. Others, such as Helena Carreras of the URV, are expecting to travel soon. Both expressed their approval of the agreement. Although Catalan is taught at several universities around the world, only Masaryk University offers a higher university qualification in the language. The agreement will benefit both universities, albeit each one slightly differently. The degree at Masaryk University is 180 credits long, whereas at the URV it is 240 credits. Therefore, in addition to receiving a double degree, Czech students who come here will also have studied the language for longer and in the place where it is spoken. URV students will also obtain a degree from Masaryk University, which will give them a double qualification and experience in a foreign university. Furthermore, for the URV it will increase the number of international students and make the institution a leader in Catalan language and literature for foreign students. The agreement will also encourage staff exchanges, research projects and joint collaboration.